By Louis H. Schimmel Jr.
Pontiac officials have considered selling some city assets in a bid to reorganize its finances. The city may not generate much revenue from its two cemeteries, but that should not prevent their sale. Editor’s Note: This article was adapted from the version published on the Mackinac Center for Public Policy Web site in August 2006. The city has been struggling with its fiscal monitoring and reporting and has hired a respected accounting firm to help improve its record keeping and accounting processes, meaning that all of Pontiac’s projected — as opposed to 2005 audited — budget numbers in this edition of MPR may be subject to change based upon new information. Many, including the city’s leadership, argue that the city of Pontiac simply needs more money. "The accompanying financial statements have been prepared assuming that the City will continue as a going concern. … (T)he City’s general fund has suffered recurring losses from operations and has a fund deficit that raises substantial doubt about its ability to continue as a going concern." In other words, each year the city spends considerably more than it receives in annual revenues. Combining the city’s 2006 losses and its 2005 deficit, the city’s current deficit is estimated to be $60 million, excluding some of the city’s one-time budget cuts in 2006. Despite some operating reductions, the city’s losses mount day by day. Negotiate the forgiveness of debt owed. 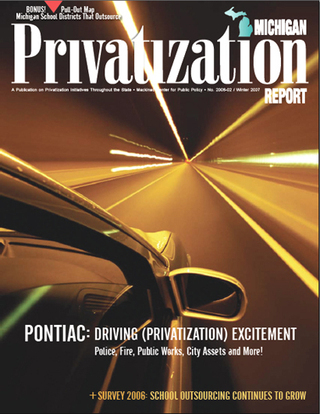 This is why privatization is so important to the city. It gives officials the chance to save money as well as generate new revenue to pay its bills. Over the past few years, the city has managed to remain a going concern only by following the three strategies described above. For instance, as of June 30, 2005, the city had taken cash out of several city funds, such as the water and sewer fund, to put in the depleted general fund to finance core city operations. This borrowing has left the other funds dangerously low in cash and unable to fulfill their statutory missions. The city also has issued bonds and deferred the settlement of a General Motors Corp. property tax dispute — the city’s principal ways of solving its deficits. In February 2006, the city issued a deficit elimination bond of $21.5 million. In March 2006, one of the city’s five tax increment finance districts repaid the city’s general fund $11.5 million for money that the district had inappropriately spent, but the money came from Oakland County’s issuing bonds on the district’s behalf. In addition, the city has numerous unpaid, overdue bills, which is simply another way of borrowing money. In 2002, the city of Pontiac settled a property tax dispute with General Motors Corp. The city had erroneously collected $23.8 million in property taxes from the company, and the settlement permitted the city to repay GM only $15.3 million, with the company forgiving the $8.5 million balance. Unfortunately, the city failed to make payments on the settlement. In December 2005 Pontiac agreed to pay GM $2 million in fiscal 2006 and another $2 million in fiscal 2007 toward the debt owed. The remaining amounts will be paid through city tax credits for projected property tax increases that would otherwise be owed by General Motors over the next several years. This move delays the city’s payments and temporarily eliminates the deficits in the city’s financial statements, but stunts the growth of the city’s future property tax revenues. To make matters worse, in November General Motors announced that it would be moving 3,600 employees from Pontiac to sites in Warren and Detroit by 2008 to save money. Fewer people means fewer taxpayers at a time the city is already bleeding revenue. The city cannot continue in this way. The question is, what should change? Many, including the city’s leadership, argue that the city of Pontiac simply needs more money. 1) The Whall Group audit. In February 2006, The Whall Group, a risk management and fraud detection firm, released a report covering some, but not all, areas of concern in the city. The report clearly demonstrates a general lack of internal accounting controls and management in city activities, particularly in the purchasing, parking, banking and Strand Theater project areas. The report goes to great lengths to identify such items as bank accounts opened by department heads; unresolved and unexplained adjustments in bank reconciliations; and financial reports that were prepared months late. Several of the bank accounts were unknown to the city’s finance department. The report further indicates that cash receipting for the parking operations is totally out of control. Various means of checking and controlling the receipts are not in place, meaning that the cash could be inappropriately diverted. Several items involving the golf course were cited, including the now-retired golf course manager’s salary, which was high relative to other city employees and was roughly 32 percent higher than the salaries of golf course managers in the surrounding area. According to the report, the manager was entirely responsible for all of the golf course’s receipting activities — which is not a generally accepted method of accounting . Above all, the report states that the city’s budget revenue estimates are greatly inflated and unrealistic. These findings are only a sample of the numerous concerns covered in the report. The good news is that the city has hired certified public accounting firm Plante and Moran to help straighten out city finances. The audit of Pontiac’s fiscal 2006 finances is due by Dec. 31. 2) Public safety. Police and fire operations accounted for 68 percent of the city’s general fund expenditures for the fiscal year ending June 30, 2005. This amount is considerably higher than in most other cities. Over the years, the city has been generous to police and fire unions in the areas of pensions, lifetime health care benefits, days off, minimum manning and shift requirements, longevity, and overtime pay. With such a high percentage spent on public safety, only 32 percent of the city’s general fund budget is left for everything else, including the Department of Public Works, city clerk, city attorney, district court, mayor and council, building department, library, community centers, human resource department and community development department. 3) General fund reductions. Because of generous spending, the city’s annual general fund revenues are considerably less than they should be. For instance, the city has created five tax increment finance districts. This means that tax revenues that would have normally gone to the city’s general fund are now going to five different boards or entities in the city for various purposes. 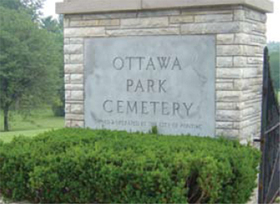 Additionally, the city’s general fund is reduced by subsidies to the golf course, district court and cemeteries. 4) City assets. The city owns assets like the Silverdome, several community centers, a golf course, two cemeteries, a closed theater on which the city has spent more than $7.5 million — and which will require at least another $2 million for completion — and scores of other properties. The city could save a considerable amount of money by not owning or operating these facilities. Selling them is known as load or asset shedding. The savings in maintenance and insurance costs alone would be substantial. If the city sold these assets to private investors, the properties would go onto the city’s tax rolls as well. There is, however, some good news on this front. City officials are giving real consideration to selling such assets (for more information, see page 9). The above issues demonstrate that finding more state or local public money for Pontiac would do little to improve the city’s fiscal health. The problem is less about inadequate resources than it is about bad management. Only major structural changes in how the city operates will bring a permanent solution to the city’s financial problems. Given the unwillingness of city officials to come to terms with their fundamental managerial problems, nothing less than the state’s appointment of an emergency financial manager to take control of city government will bring the necessary structural changes in Pontiac. Lou Schimmel is director of municipal finance with the Mackinac Center for Public Policy.